U.S. #1251 was issued for the hospital’s 75th anniversary. 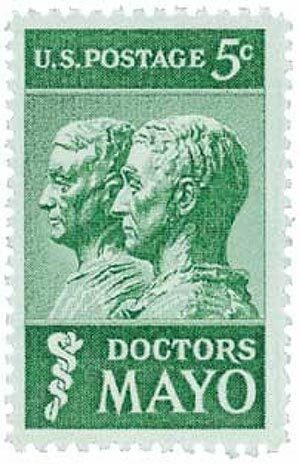 On September 30, 1889, the first building of the Mayo Clinic opened to the public. The Mayo Clinic evolved in stages. Its history can be traced back to the Civil War, when William Worrall Mayo was made an examining surgeon for the military draft board in 1863 and sent to Rochester, Minnesota. He liked the town so much he decided to stay and invited his wife and two sons to come live there with him. U.S. #1331-32 – America’s first twin stamps. On September 29, 1967, the U.S. Post Office issued its first attached pair of stamps to have a continuous design. The stamps, officially titled Accomplishments in Space, were issued to honor the 9th anniversary of the National Aeronautics and Space Administration (NASA). The stamps were the first to be designed by renowned space artist Paul Calle. U.S. #2506-07 – U.S. joint-issue stamps issued on this day in 1990. On September 28, 1990, the USPS released two joint-issue stamps commemorating the 1986 compact of free association with Micronesia and the Marshall Islands. During World War II, Japan established a powerful empire based in the Pacific Ocean. After the war, many small island groups were left without a government, and did not have the resources to rule themselves. In 1947, the United Nations established the Trust Territory of the Pacific Islands. Administered by the U.S. government, the territory consisted of the Marshall Islands, the Northern Mariana Islands (except Guam), the Federated States of Micronesia, and the Palau Islands. U.S. #1857 was issued a day after Carson’s 74th birthday. On September 27, 1962, Rachel Carson published the book Silent Spring, which inspired a massive environmental movement in the United States. 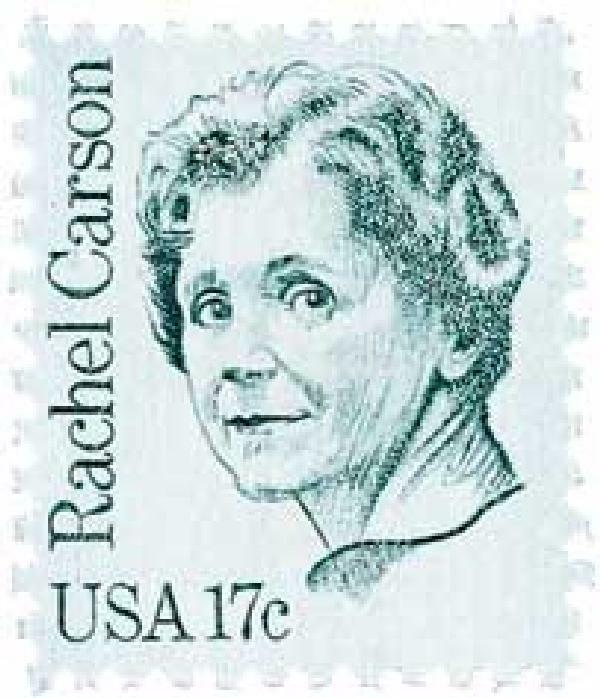 Rachel Carson, the “mother of the modern environmental movement” was born in Springdale, Pennsylvania. After graduating from the Pennsylvania College for Women she worked for the U.S. Fish and Wildlife Service, writing for radio and various publications. U.S. #2239 was issued on Eliot’s 98th birthday. 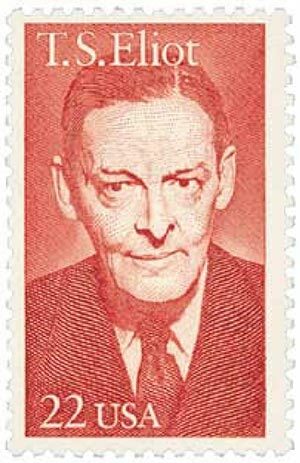 Thomas Stearns Eliot was born on September 26, 1888, in St. Louis, Missouri. Eliot attended schools in St. Louis and Massachusetts before entering Harvard in 1906. After graduating, he worked at the school for a year as a philosophy assistant before heading to France and England to further study philosophy. U.S. #372 was issued on this day in 1909. 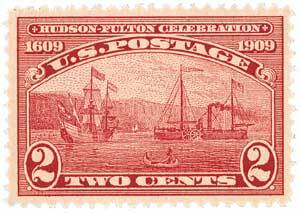 On September 25, 1909, the Hudson-Fulton Celebration opened in New York and New Jersey. The purpose of the celebration was to honor the 300th anniversary of Henry Hudson’s discovery of the Hudson River as well as the 100th anniversary of Robert Fulton’s first successful commercial paddle steamship, the Clermont. Additionally, the celebration would be a showcase for the accomplishments of the people of New York City.